This film tells the story of protagonist, Esi through her relationships spanning from childhood and on with her father, Kojo, and her uncle, Kwabena. The base of the film is centered around Kojo’s disappearance on a mining expedition, which results in Esi’s magical journey to rescue her father. Alisha Acquaye, 'The Burial of Kojo' is a Tale of Two Brothers, a Blessed Child and Spiritual Destination,” okayafrica. (online article). Citi News Room, The Burial of Kojo Review: Blitz Bazawule Impresses In His Directorial Debut, Modern Ghana. (online film review). 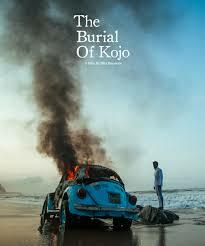 Tambay Obenson, How ‘The Burial of Kojo’ Is Giving a Boost to an Unsteady Ghanaian Film Industry, IndieWire. (online article).